This authentic and charming holiday home is beautifully situated and equipped with stunning details, like wood-beamed ceilings and terracotta floors. The property lies along with 3 other houses on a large, well-maintained property. Along with the other residents you have access to a large garden with shaded seating areas, a large swimming pool, playground equipment, a barbecue and breathtaking panoramic views. There are also indoor parking spaces available. You don't need to leave the premises for a good wine, there is wine being produced on the property. 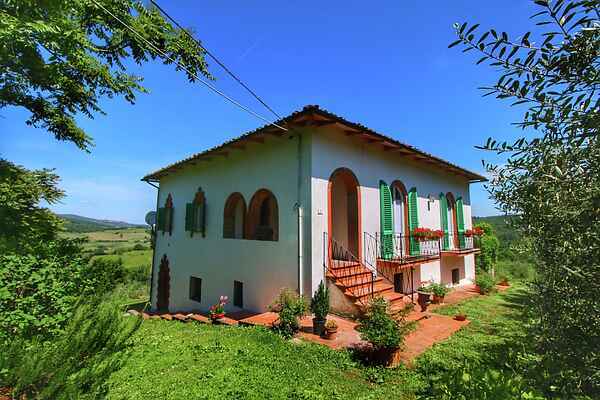 The estate is located in a typical Italian village surrounded by beautiful Chianti hills. Lovely to relax, but also a great base for exploring the beautiful surroundings. In Ambra, at only 2 kilometres, you can do your small groceries. If you want to really unwind come visit the beautiful thermal baths in Rapolano, 13 km away. A little further away but also a real attraction is the magnificent Siena (35 km). This is one of the most charming towns of Tuscany. Also, Arezzo (30 km) is a great option for a day of culture. Farmhosue IL CIPRESSO is located in a little village named Gavignano placed on the top of a hill of the Chianti area. It is very near to a little town named Ambra. Here at only 25 Km from Arezzo, 45 km from Florence and 30 Km from Siena, there is the Mannucci's farm where it is possible to be lodged in typical farmhouses completely remodelled with an independent garden, furthermore the guests can have the access to the beautiful swimming pool located in one of the most panoramic place of the area completely immersed in the beauty of nature. Besides it’s possible to take wonderful and relaxing walks or rides on the mountain bike along the ancient streets of the medieval villages.